How does SAR detection work? The type of earth observation data used will depend on the operational needs. There are two main categories of earth observation data: Synthetic Aperture Radar (SAR) and Optical data. SAR sensors use radar frequencies to construct an image of the surface of the earth, which means that images can be acquired regardless of weather conditions and cloud cover, and at any time of day or night. By measuring the roughness of the sea surface, resulting images display features which stand out against the background; for example vessels appear as bright spots, while oil spills appear as dark shapes. Optical images are more limited when there is bad weather, cloud cover and at night. However, in good conditions, very high resolution images can provide a wealth of information in different spectral bands (e.g. visible, near infra-red, short wave infrared, thermal, etc.). SAR is used primarily for vessel detection and pollution monitoring, but can also be used for other purposes such as extracting wind, wave, and ice formation. 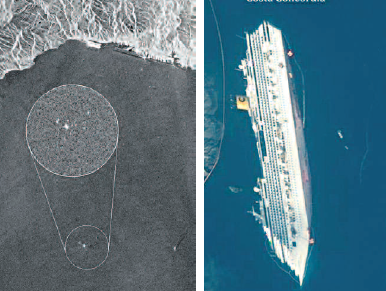 Optical images are used for vessel detection, and characterization. Moreover, and depending on the resolution, these can also be used for object and activity detection, including: fish cages and fish traps, rendez-vous at sea, ice formations, port monitoring, vessel identification, etc. Images are available with resolution of less than 1 m to 100 m, and scene sizes vary respectively from 5 × 10 km to 400 × 1,600 km. For a standard 200 × 200 km image, the full service – from satellite acquisition to the delivery of the processed image to the end user – takes less than 30 minutes. Images are available with a resolution of less than 0.3 m, and scene sizes vary from 50 sq. km to over 3,000 sq. km. Delivery times vary from less than 45 minutes to over 24 hours, depending on the operational needs of users and the size of the images. EMSA makes the EO products available to authorised users through IMDATE and SEG platforms. 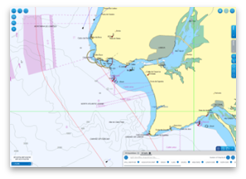 For more information on the value-added and/or fusion products available to users please consult the Copernicus Maritime Surveillance Product Catalogue.